Pavia Council No. 48 is associated with St. Mary Church, Bethel, CT. Founded in 1888, the council has a long distinguished history of service to the parish and the community. Pavia Council has won numerous awards for service and achievement from both the state and national Knights of Columbus organizations. The Knights of Columbus is a fraternal organization open to Catholic men 18 years of age or older. The programs highlighted on our web site portray only a few of the activities of Pavia Council. With 200 members in Bethel there is a Knight involved with virtually every aspect of our parish life. Interested in joining our ranks? Let us know! From September to June, Pavia Council holds regular business meetings about twice a month in the St Mary Church Hall. Please refer to the council calendar for exact meeting dates and times. On the evening of November 14, 1888 Father Patrick OConnell, Pastor of St. Mary Church in Bethel, met in the church basement with a group of 24 young men to interest them in a fraternal society called the Knights of Columbus. In light of the K of Cs growing reputation Father OConnell had little trouble convincing the Bethel gathering to establish a local Council. Hatters, manual laborers, farmers, clerks and shopkeepers, nearly all in their 20s and 30s these men would become charter member of Pavia Council. William P. English became the first Grand Knight. Several years earlier in 1882, also in the basement of another St. Mary Church in New Haven, Father Michael J. McGivney laid the groundwork for a mutual benefit society for Catholic men. In an era without Social Security, organizations providing insurance of immigrant families in times of sickness and death were an economic necessity. The bitter anti-Catholicism of the late 19th century had generated a strong bond of religious and social unity within Catholic ethnic groups, so why not establish a local fraternal insurance society for Catholics the young priest reasoned. Today the cause for the sainthood of Father McGivney is before the Church. This history is an excerpt from A One Hundred Year History of Pavia Council No. 48, prepared for THE CENTENNIAL YEAR by Isabella C. Taylor November 1988. 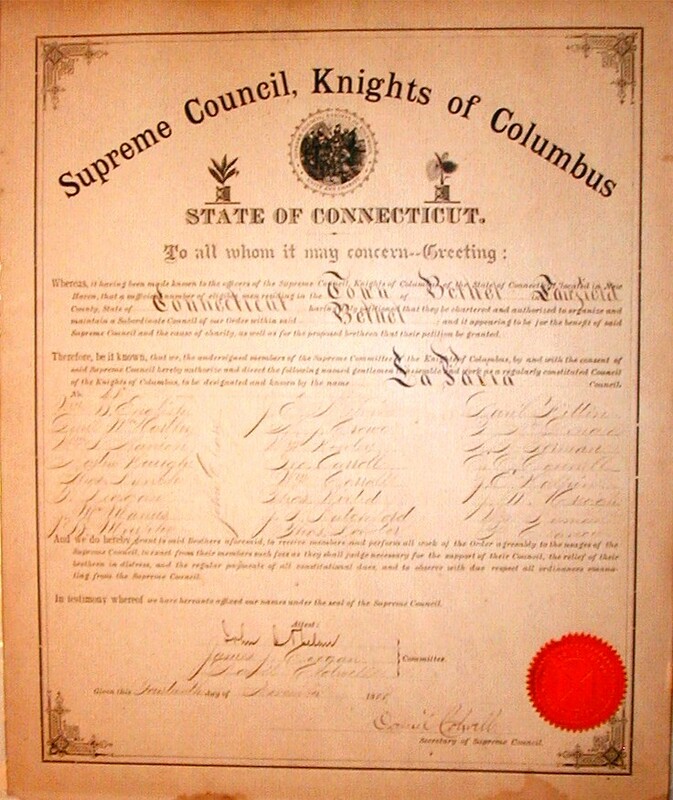 This 38-page document, drawn from the minutes of council meetings, not only tells a fascinating story of the Knights but also of life in Bethel. It is available at the Bethel Public Library Reference Department in the vertical file. Copyright © 1998 - 2013 Knights of Columbus Pavia Council. All rights reserved.